The Long Neck people was something I’ve only vaguely heard about. They were like a strange, beautiful legend that only existed within the pages of a National Geographic magazine or from behind the TV screen of a documentary about an ancient faraway culture. Is it possible that they still exist in this modern society? 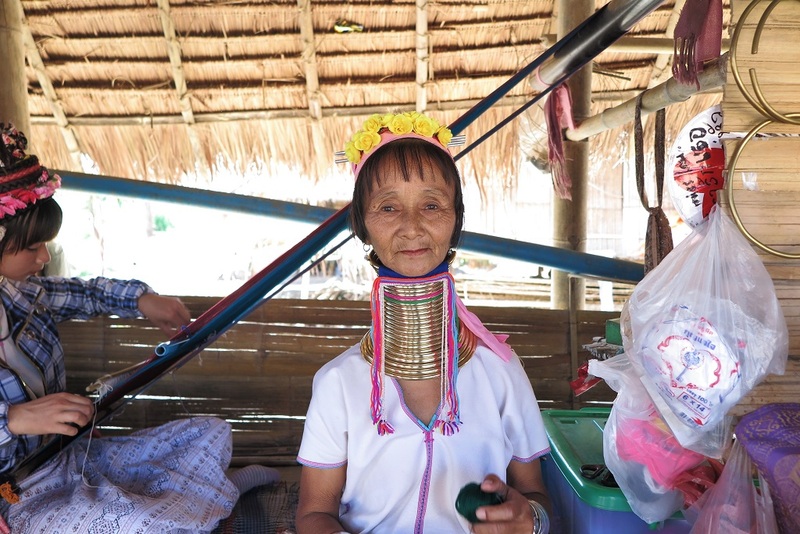 So when I learned that they have a name (Karen Long Necks) and lived in Thailand, and that their village was accessible from Chiang Mai, I jumped at the chance and signed up for a tour that included a visit. Though I really wasn’t sure what to expect. It was only after the tour that I did a little bit of research on these people. 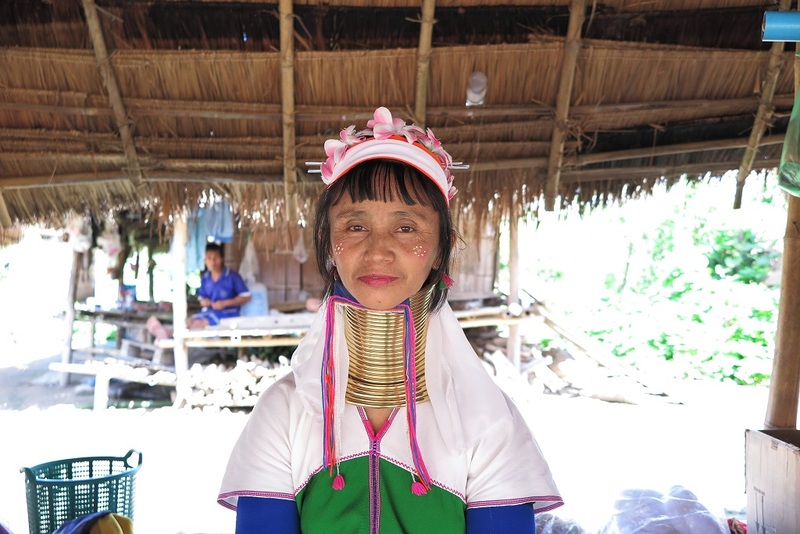 The Karen Long Necks originally lived in the hills of Burma (now Myanmar) and fled to Thailand due to political unrest in their country. As refugees, it was hard for them to find work opportunities and assimilate into the modern society. As a result, their population is confined to small areas. 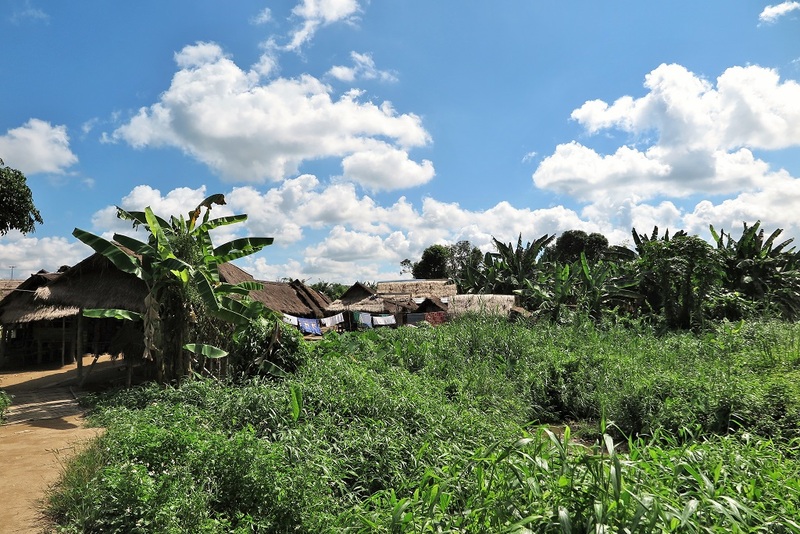 Today, most of their villages are located between Chiang Mai and the Golden Triangle (the point where Thailand, Burma and Laos meet). We drove through kilometers of lush green fields to get there. 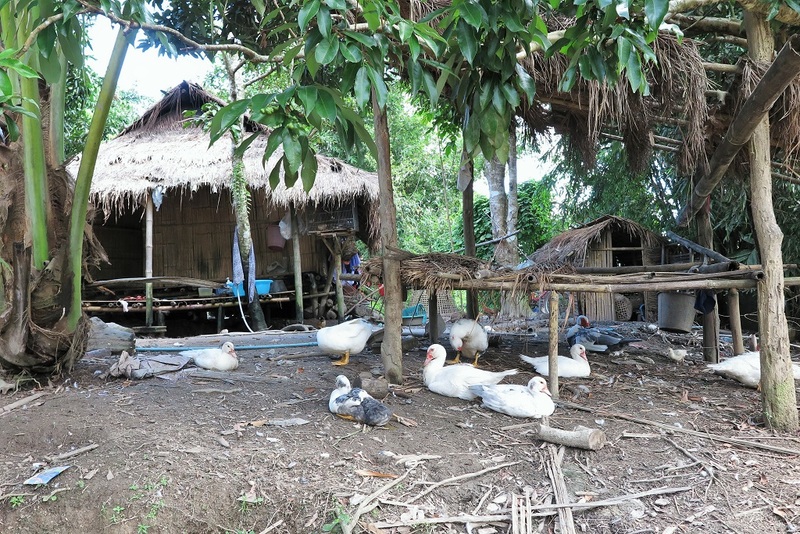 We arrived and parked the car, and immediately saw little grass and bamboo thatched huts with a lot of geese running around. You get the feeling that you’re miles from any modern civilization at this point, and that this is true simple, primitive living. 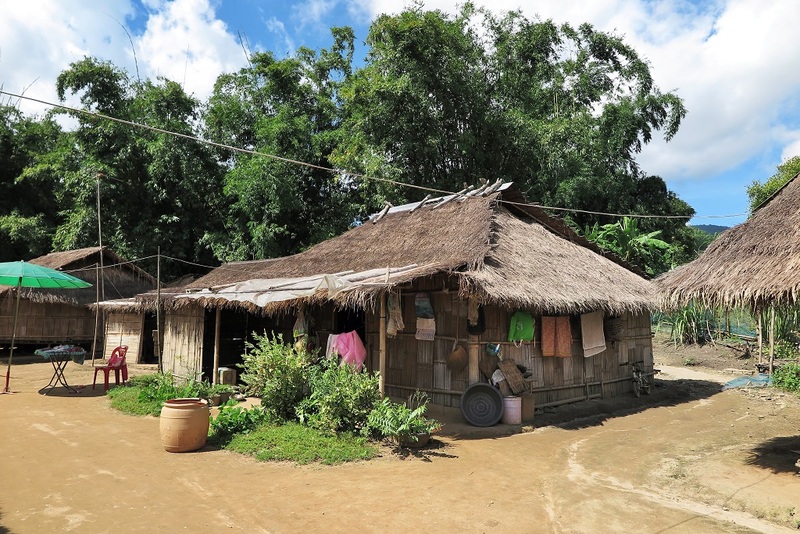 It felt a little weird to barge into their village swinging DSLR cameras and smartphones. We walked through a little pathway with stalls on either side selling all sorts of handicraft goods. At the entrance to the Long Neck village, our tour guide paid the entrance fees for our group. And then we stepped into a little dirt clearing with bamboo thatched huts forming an U-shape on the perimeter. The group split up by this point and we individually made our way around the huts. Each one had a long neck girl sitting at a loom weaving scarves. Hanging all around them are colorful displays of their labor. Each little hut had the exact same scene. It made for a pretty picture: a girl wearing golden rings, sitting at a loom among the vibrant scarves. Later, I learned that the women of the long neck tribe wear heavy brass rings across their necks and shins. Every 5-6 years or so, the rings are removed and they get a new one with an additional ring. The rings don’t actually elongate their necks upwards per se, but rather push down on the collarbones, thus squashing the body down. After such a long time of wearing the rings, they couldn’t unwear them even if they wanted to, because their neck muscles have weakened and now need the rings for support. 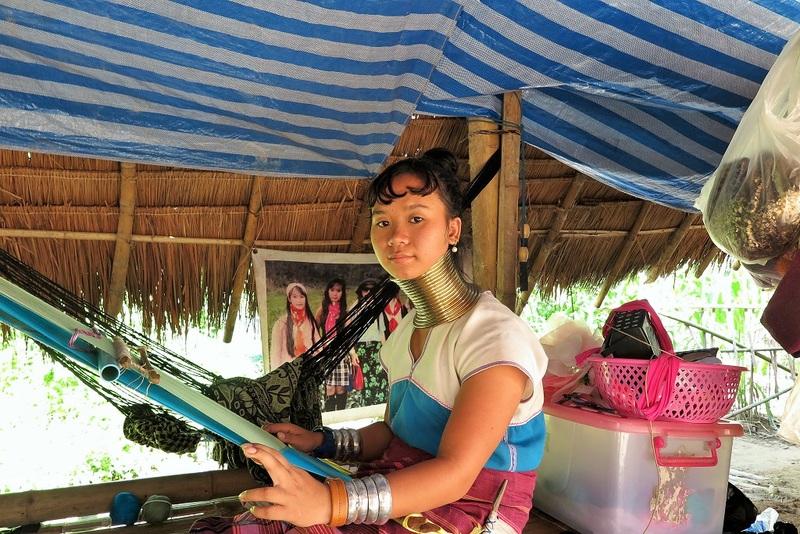 I heard that many of the young Karen women are breaking away from this neck lengthening practice. I suppose as with all ancient traditions, there comes a time when assimilation can’t be avoided, and this one will fade out too within the next few generations. It’s a shame to think about a culture dying out. Walking among them, you really get the feeling that you’re witnessing a vastly different culture, so removed from our modern world (though I did spot one girl texting on a smartphone!). But then there were the tourists to destroy this image. Tourists shoving their digital cameras and smartphones in these girls’ faces to snap pictures, and then leaving without so much a word. Not even a thank you. And the girls playing along and patiently smiling for the pictures. I couldn’t believe that so many tourists were acting like this! It all felt kind of wrong to me. These were just people living their normal lives! It’s not a human zoo, or a freak circus show! But then I realized: wait a minute, I’m one of these gawking tourists too. “I have a feeling this is what they’re here for….” he said. “Did you notice that we paid an entrance fee to get in here? He was right. We did pay. I looked around. The whole thing did kinda feel like a tourist attraction, like a staged scene for something for tourists to gawk at. Each stall sold the exact same scarves and woodwork. There was one little girl who proudly showed off her stall. “You like? 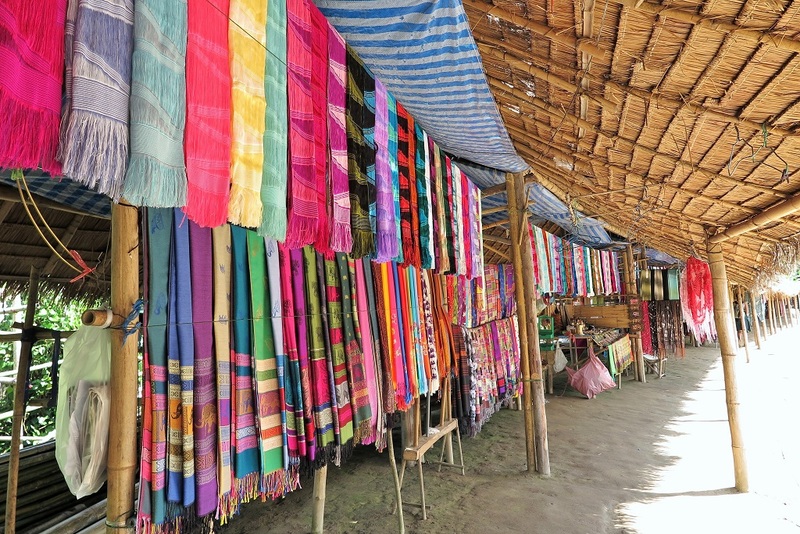 I make!” She proudly swept her arm over the rows of colorful scarves, reciting the prices. “You made these?” I was amazed. She was so little. “How old are you? What’s your name?” we asked. I wasn’t sure how to react. In my world, where a 10 year old girl would be shopping at the mall or playing in the park, this little girl was expertly knitting scarves for tourists. I wondered how long she’s been making scarves, and if she’ll spend her whole life in this village. Maybe I felt like supporting her (though I don’t know if I’m supporting child labor at this point). Maybe I felt guilty for being one of the tourists here to gawk at them. But I ended up buying one of Mary’s scarves, even though I have absolutely no need for a scarf in hot Southeast Asia. It’s a beautiful soft white scarf with purple flowers. Final verdict: I’m glad I was able to see them (it’s something I never thought I would actually see), though I did feel a little bit bad about being just another gawking tourist. I still feel a little weird about taking pictures of people, but at the same time, I do hope that opening their village up to tourism is helping them lead richer lives. We went with a tour so we only had a limited time here, but it would have been nice to have more time to talk to them and get to know the women. Also, we weren’t really deep into their village, only at the marketplace where they sell their goods. So don’t expect a raw authentic visiting experience. Practical visiting information: Obviously, the easiest way to visit is with a tour (I honestly wouldn’t know how you would get here independently because it felt so far from everywhere, but I’m sure someone more skilled at planning than us could figure out a way!). 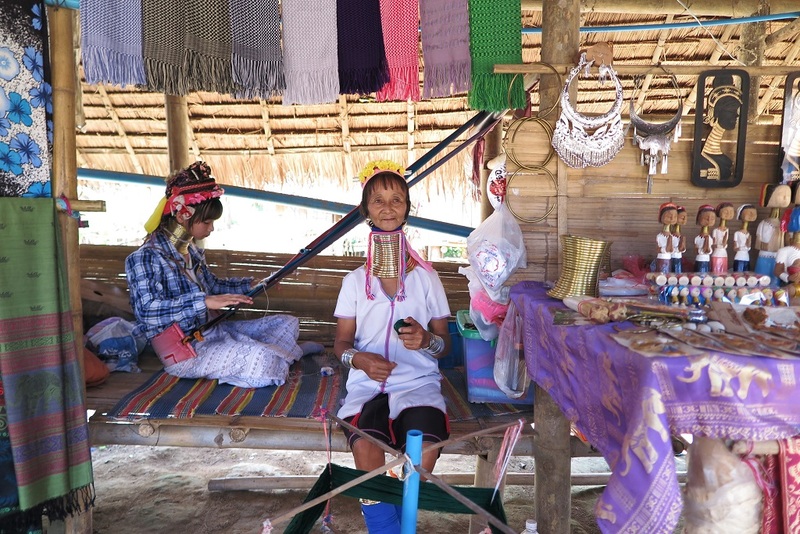 We signed up for one-day tour that included Chiang Rai, the Golden Triangle, Laos market, and Karen Long Neck village. Any of the local tourist offices in Chiang Mai will offer this tour or similar, or even tours just to visit hilltribe villages. Have you visited anything like this? What you do feel about humans on display? This post is linked up to SundayTraveler with Pack Me To and others. Well, I agree with D. That’s probably a cultural village, especially set up for gawking tourists (LOL! ), so they expect to have their photos taken. In fact, they would probably appreciate the photos being shared on social media and get more people to come (a.k.a more money). I think there’s another tribe in Africa, or maybe a few, with similar neck elongating culture. It was supposed to be a symbol of beauty, long neck equals beauty, although I don’t quite understand it myself. I’m all for preserving culture, but if it is something that jeopardizes your body, I can understand if the younger girls are trying to do away with it. Yeah I think it was set up just for tourist visits. It felt a little like exploitation of the people, but I’m sure our tourist dollars are doing their village good. Hmmm I haven’t heard of the one in Africa! I’ll have to look into it! It makes me a little sad to think about a culture and traditions dying out, but you’re right (and my mom said the same thing too), if it’s harmful to the body, then it’s probably a good thing to stop it. 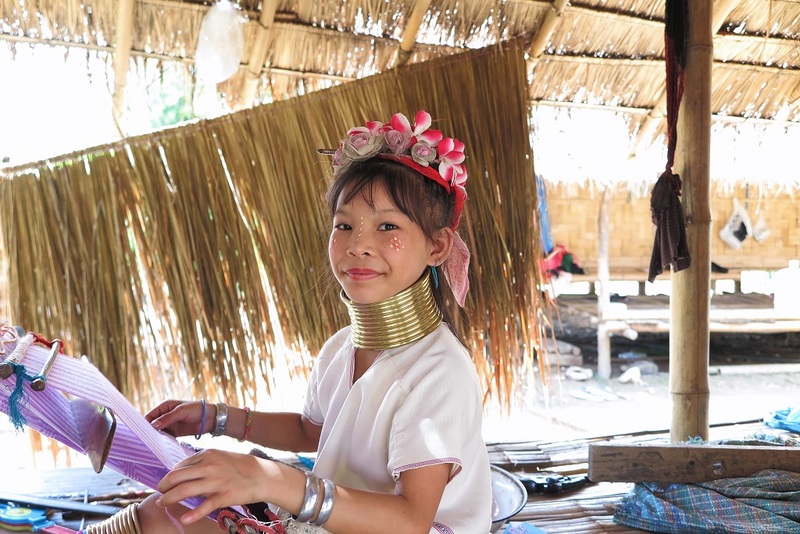 We researched the Karen tribes before arriving in Chiang Mai and read a lot saying you shouldn’t support the tour business because it is exploiting them, and a lot saying you should because you are supporting their livelihood. It’s an interesting thing to consider! We haven’t been, but it does look amazing. What beautiful people! It is an interesting conundrum! I’m sure they are happy to get our tourist dollars, but at the cost of their exploitation, I guess. And it did feel that way. In the end, I am happy I visited them, because I’ve never seen anything like that. I think you need to have a talking to with Pumpkin and ask why he’s been to all these places and didn’t take you!! Lol! I really can’t believe that some tourists just go up, stick a camera in their face, and then walk off without a word! Asking is definitely the right thing to do. I know what you mean about people on the streets. Everytime I walk out on the streets here, I want to take sooo many pictures, but I never do because those are just people going about their normal daily lives, and I feel bad if I treat them like they’re fascinating subjects. I’ve never been to anything like that, but thanks for sharing. Little Mary was adorable and I probably would have bought out her stall. Haha. I know! I wanted to buy more scarves from her, but as it is, I’m barely squeezing this one scarf into my luggage, lol! Wow! I’ve never seen anything like this. 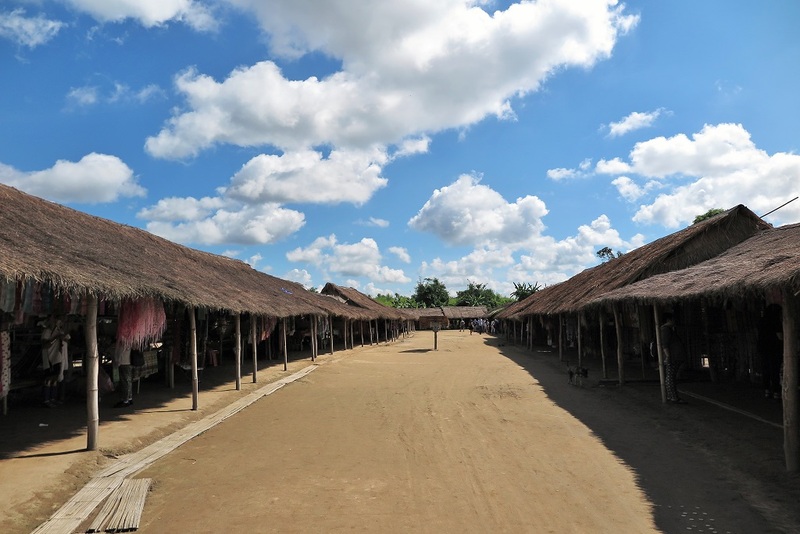 I’ve been to fake simulations of villages like this as a child, but nothing this intense! I can’t imagine how I would feel seeing this. On the one hand it’s so different, cool and absolutely fascinating. On the other I can see how you would feel uncomfortable treating this people like just an expedition. Still it is beautiful and so so interesting! Yeah, exactly! That’s why I signed up for the tour, because I couldn’t pass up a chance to see them. But once I got there, I realized it kinda felt like I was just gawking at them :/. I’m still glad I was able to see it though! Wow, thanks for sharing your experience, Anna! I appreciate how you shared how you felt while on the tour. It does seem like an awkward situation – I would feel uncomfortable treating them like an “attraction,” but like you said, it is set up that way and hopefully the village is benefiting from the extra income. I’m glad you got some pictures and were able to share a little about this culture with us! Yeah! I’m still glad I went because I’ve never seen anything like that before (and I wonder if they really will die out in the next few generations), even though it did feel weird. I wish I was able to learn more about the culture though :(. The tour didn’t really give us enough time to do that, but I guess that’s what google is for! They are fascinating, aren’t they?! I’m sure they are benefiting a lot from the tourists who come to look at them, so I’m trying not to feel bad anymore! I guess I am glad if we are able to help them have better lives. Honestly I didn’t really even think about it before we got there. I just knew that I wanted to see them. But in the future, it’ll definitely make me think harder about this kind of tourism! 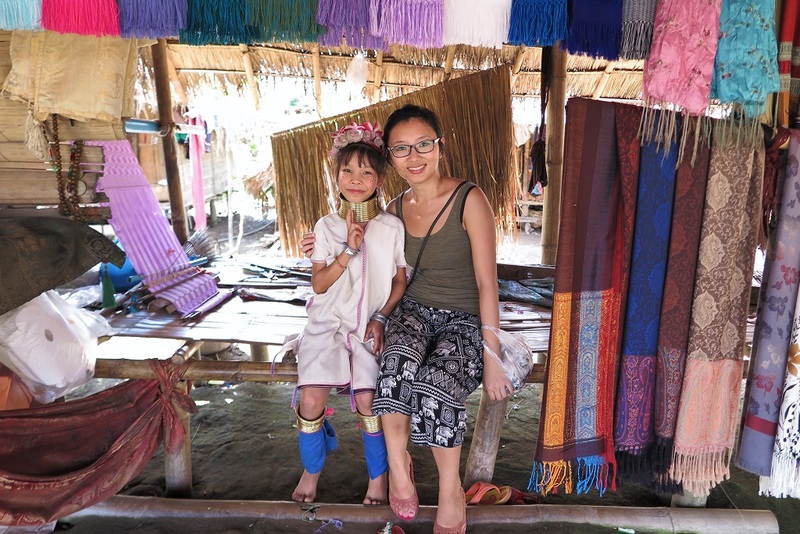 We also visited a Karen Long Neck tribal village when we were in Chiang Mai. I had my kids with me, and I have some photos of my daughter with Karen girls of the same age next to her. It really makes you think about the different lives they lead. I also worried about the whole Human Zoo aspect of visiting them and took time to talk to people. When I asked on lady what she thought about being there, she said making scarves was much, much better than her old job of working in the fields under the hot sun with those metal rings on. She gets to sit down all day in the shade and just talk and weave. However, she did say that she wished the Thai goverment treated the Karen people who are refugees from Myanmar better. Oh wow!! Thank you so much for sharing your experience, Michele! I really wish we had more time to sit and talk to them too, but we didn’t get that much time with the tour. I’m glad that their lives are better making scarves than working in the field all day! I wonder how they are treated under the government. I’m glad you go t the time to talk to them!